It’s the go home Smackdown before Summerslam and in recent memory, go home shows have not been great. But Raw was decent enough last night so let’s see if Smackdown can continue it’s good run of form. The highlight of this week’s Smackdown was a series of video packages retelling the 8 year history of Daniel Bryan and The Miz. This was shown in 3 separate parts. The first one told their history in the first season of NXT (the old game show format, not the good one) where Miz was Daniel Bryan’s pro. They also interspliced clips of current them talking about it all. The 2nd package showed the rise of both Daniel and Miz both becoming world champions along with Daniel having to retire into their iconic moment on Talking Smack. The 3nd package then closed off their story with the recent history of Daniel returning to the ring and bringing Miz over to Smackdown up until now. It finished with a fired up Daniel Bryan cutting one hell of a promo. This was all amazing. The WWE production guys have been amazing lately and these 3 packages were top notch all around and set up great for their Summerslam match this Sunday. Also Miz & Mrs has been renewed for a 2nd season. I don’t know how I feel about that. This week’s Smackdown opened with Charlotte, Becky & Carmella coming down to the ring to have a face to face to face. It can be best summed up by Becky Lynch’s Instagram story so check that out. Carmella though Becky should go back to being a clown. Becky isn’t happy that Charlotte is now in the match but now has new dream of beating Carmella and whooping Charlotte. Carmella bigs up Charlotte and the fact that she beat her twice. I’m not sure if you’ve heard that before. Charlotte says that Carmella can’t hang with anyone in the division, and that in order to beat Asuka, she had to dig up Ellsworth. Charlotte says that people don’t respect Carmella because she’s a Diva living in a Women’s era. Oh burn, take that, 2000’s WWE booking committee. Carmella says that she’s proud of being a Diva. Oh god no. She compares her beauty, body and charisma to the others. (I have to say Becky wins on all 3 of those). Carmella also says that she’s the champ and they aren’t. Nana nana boo boo, stick your head in doo doo. 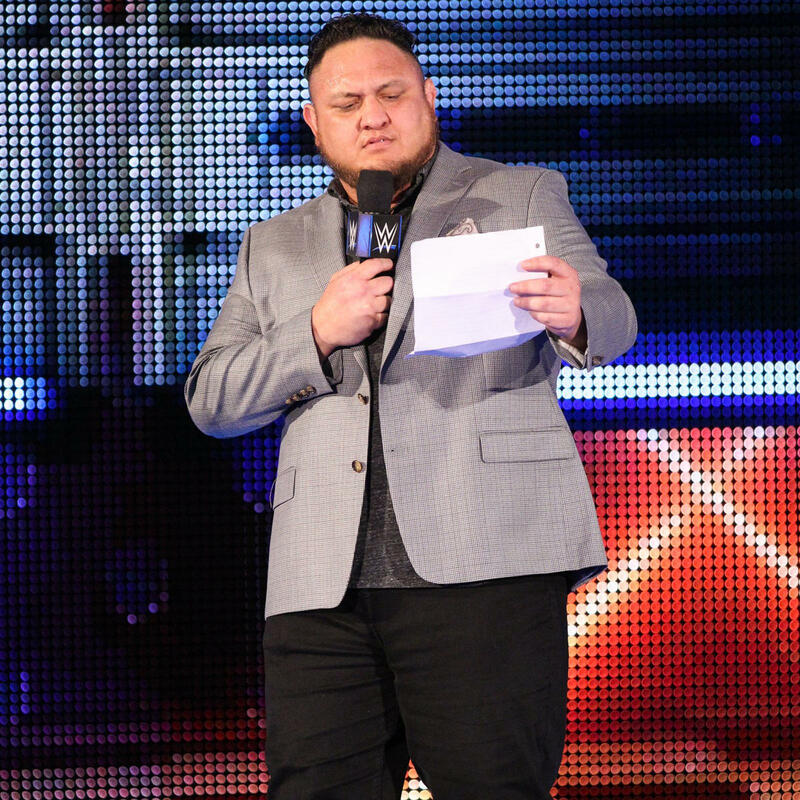 Samoa Joe and AJ Styles continued with their verbal confrontations this week on Smackdown. AJ and Joe were both offered an opportunity to say their piece in the ring. AJ took up that opportunity as he had made a promise to his wife. Joe turned it down because he’s shy. But he did promise Paige that he will continue to do whatever he pleases whenever he wants to. In the main event segment, AJ made his way out to the ring and talked about the pressure the title gives. Joe is now hitting his pressure points and he showed clips from the last couple of weeks. He said that Joe had brought him to a place where he wanted to kick his head off but then he went home and chatted to his wife who said that he can’t lose his cool like that. Joe then interrupts AJ’s heartwarming story and has a letter with him that he got from a member of the WWE universe. I’m not sure who writes letters anymore, surely he printed an email. But let’s see what it says. And that’s where we went off the air as AJ just looked at Joe confusingly. It feels like there was supposed to be more to this but they got cut short on time. It didn’t land the way I think they wanted it to land and fell a bit flat. 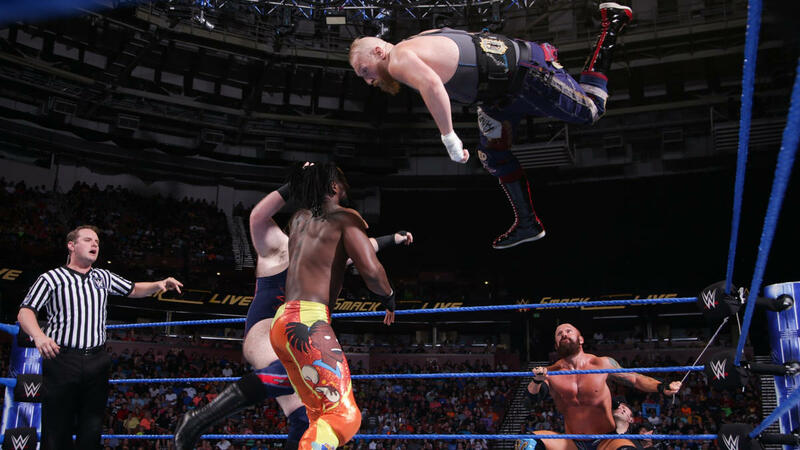 SAnitY took on The New Day and it was Kofi’s birthday. Killian Dain also had new ring gear. It’s a singlet. I don’t like it. It looks too generic. His old one was a lot more unique and him. This screams a Vinnie Mac change. The New Day pinned Dain after an Up Up Down Down for the win. And thus continues SAnitY roll down the card. The Rusev/Lana/English drama continued also this week. Aiden English was looking for redemption as he faced off against Andrade ‘Cien’ Almas and lost. After the match, Zelina Vega cut a promo on Rusev and Lana before they came out on stage and cut one back. Rusev/Lana will face Almas/Vega on the Summerslam preshow this weekend. Jeff Hardy was back this week and beat Shelton Benjamin in a match. Afterwards Shinsuke came out and tried to attack Jeff but ended up getting a Twist of Fate and Swanton Bomb for his troubles. All the while Randy Orton watched on from behind the curtain at the corner of the stage. Honestly he probably couldn’t see anything from where he was standing. Standing sideways at a TV probably would have served him better. Two weeks in a row now that jobber tag teams have gotten names. This week, the 3 person team of The Triple Threat got murdered by the Bludgeon Brothers. God rest their souls. Tis awful sad, awful sad. Not as good as the last few weeks this week but still not a bad show. Go Home curse seems to have hit the show with a couple of nothing in ring promo segments that didn’t really advance anything and fell a bit flat. But those packages about the Daniel Bryan/Miz feud were awesome (pun intended). It really made this feud seem so big and you forget how long it’s really been going for. I’m looking forwards to the Smackdown matches at Summerslam this weekend and I reckon they will blow Raw’s ones out of the water. Of course NXT Takeover will destroy all so it’s all a moot point really. Feel free to comment on our posts too. We don’t bite, I swear. We love talking about wrestling and live tweet PPV’s, Raw’s and Smackdown’s. Here you will find clips from our weekly Wrestling Podcast, the one we mentioned above. If you want to listen to the full episode, you check out our most recent one here. There is a new one every Friday. And don’t forget to check out all our other Wrestling content here. About the Author: Nicky Bowe - Junior Executive Vice President of that feeling you get when you are walking alone at night and you're sure there's someone there. Nicky loves Wrestling, Video Games, Batman, General Nerdy Stuff, Pina Coladas and getting caught in the rain. He likes DDP Yoga and having half a brain. Quite fond of making love at midnight, doesn't need to be in the dune of a cape. If he's the author you are looking for, write to him and escape. Next Story → WWE SummerSlam 2018 Predictions! AEW – Will it succeed? Here is Fitz’s 2Bits!